Who will win the battle for Gotham City's soul? Beautifully detailed chess board for the ultimate Batman fan! This complete set includes 32 detailed chess pieces! Collect the entire Batman Chess Collection in one package! 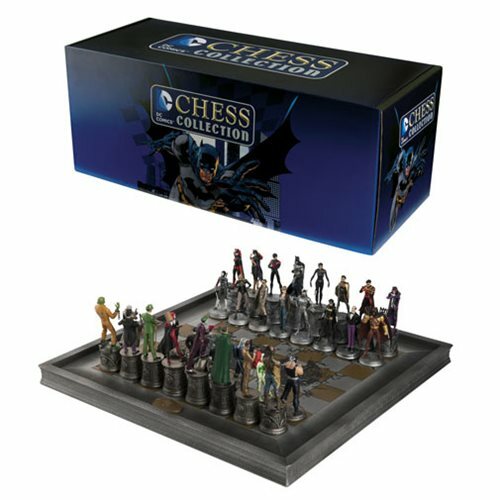 The set includes 32x of Gotham's iconic characters as chess pieces. The heroes are led by Catwoman and the Dark Knight himself, while the villains honor the Joker and Harley as king and queen. Each figure is intricately detailed in 1:25 scale. The Dc Comics Complete Batman Chess Set is truly completed by the deluxe chessboard included. The "battlefield" sits atop a raised board featuring carved edges that look like a Gotham City rooftop. Ages 14 and up. Batman Odyssey #1 Batmobile Die-Cast Metal Vehicle and Mag.